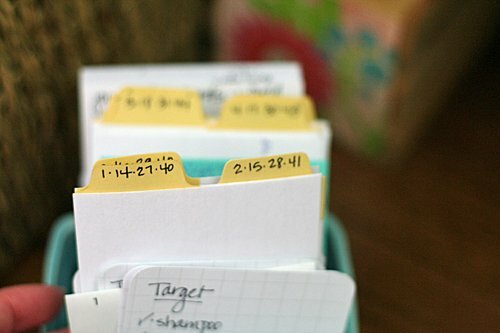 This is the second post in a series on getting organized for Project Life. Go here to read the first post. Project Life is a memory keeping system developed by Becky Higgins. 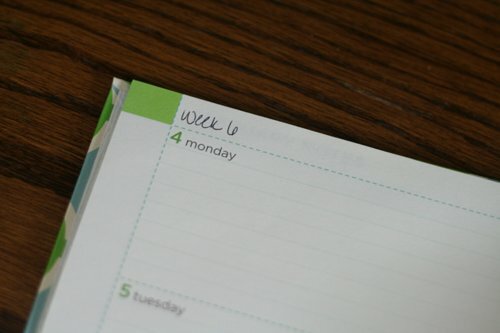 I’m using Project Life to document 2013, week by week, as part of my 13 goals in 2013 challenge. Now that you’re up to date…let’s pick up where I left off on obstacle #4 from my failed attempt at Project Life last year. As you may know, I have a home office that I also use as my creative space. I love this room. 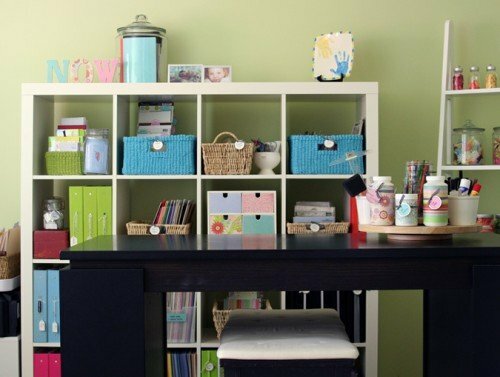 It’s organized just right and has nice big work surface that’s perfect for creative projects like Project Life. The trouble is this: I spend a lot of time in this room during my weekdays – which is great. But in the evening, I want to be upstairs where my family is and where life is happening. Last year I tried to fit Project Life into my Creative Space…and it just didn’t work. I needed some a system that worked in my family room, and to do that, I had to solve a bunch of smaller problems. The first system I needed was an easy way to edit photos in our family room. Our photos are all stored on (and regularly backed up from) a PC in Jay’s office. I won’t bore you with all the computer logistics that took place last year, except to say that I changed computers in the middle of last year, and this in turn caused a log jam in my photo processing process. With everything else going on last year, this wasn’t the most important thing for us to figure out, until Project Life made it a priority. At least once a week (or when I need photos for another purpose, i.e. blog posts) I download photos to the PC in Jay’s office. I set up weekly directories for Project Life, and download the photos right into the weekly directories. On “Project Life Sundays” I transfer the photos to a portable backup drive and then to the Mabook which lives in the family room. From there, photos are uploaded to Walgreen’s for printing. Works great. At some point, I will transfer the edited photos back to the portable backup drive and then back to my old PC for permanent storage…but that can happen in bulk after a period of time has passed. The original photos are in tact and backed up…so no worry over data getting lost. Problem #2: I need any easy system for capturing the stuff of life. Organizing System #2: Make it simple to capture daily notes. In 2012 I didn’t have a good system for capturing little moments and memories I wanted to include in my album — funny things my kids said, quotes, what we did or ate on a given day, the weather, daily highlights or low-lights. I tried to capture things right on the Project Life journaling cards…but that didn’t work for me. I didn’t know which card I wanted to use…because at the core, I like things to match or at least look good together, and what colors would be in the photos on this page? (I had no idea.) I also knew that not everything that got documented would end up in the finished Project Life album, and I didn’t like the idea of wasting journaling cards. So…a new system was needed. 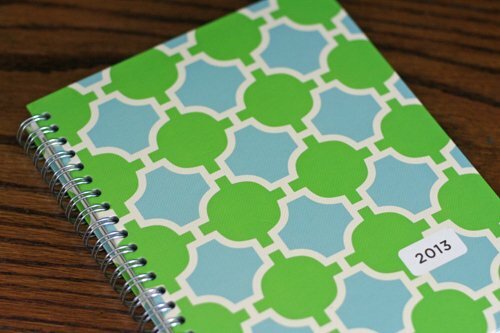 First, I purchased a little 2013 planner from Target made by Greenroom Eco. The size is great because it fits in my purse, so I can catch up or capture things when I’m away from home. I update notes every couple of days. Sometimes I like to let a little bit of time pass (a day or so) so the true highlights of a day stand out. Other times I journal about the day on the same day. In this planner, each month includes an open two-page spread that I use for longer stories. I simply put an asterisk on the day’s entry to direct me to the longer story so I’ll remember it’s there when putting together my weekly pages. Second, I use this little small farmers market basket from Anthropologie to collect other small, random bits like ticket stubs, quotes, business cards, etc. 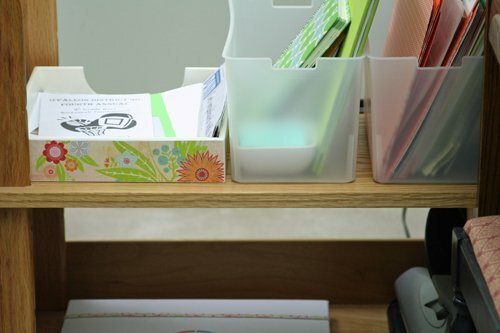 When my kids say something funny, I jot it down on a sticky note or index card and file it away.I keep a date stamp (similar to this one) and stamp pad in the front. This way, I can stamp the back of each little note and remember when each memory happened. Using 3 x 5 cards I created little dividers. The dividers have numbers on the top to represent the weeks. Since I intend to keep caught up, I put several weeks on each card so I can reuse them. When a week is done, I move it to the back. It will work it’s way back to the front and show up again when I need it for the next week listed. 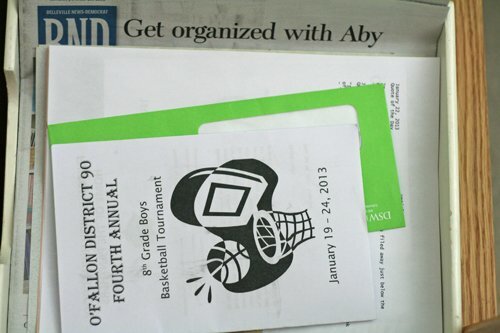 Third, I am using an in-box to collect bigger pieces of memorabilia I may want to include in my album…like newspaper articles, stuff that comes home from school, programs, etc. I don’t over-organize this…just a nice little horizontal stack with the newest stuff on top and oldest stuff on the bottom. My weekly planner reminds me which items belong to which week, and many of these items are predated. If I’m concerned I’ll forget a date I want to remember for an item, the date stamp is really close by. I keep the in-box in a desk drawer that was designed for a printer. 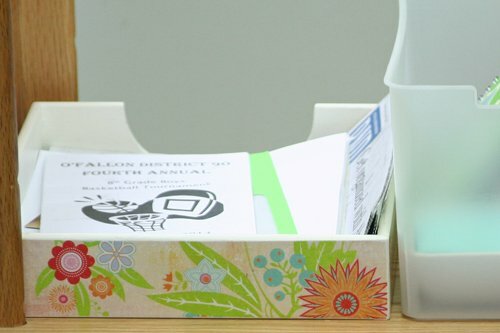 It’s super easy to pull the drawer out and drop things into the in-box. Easy means I’ll do it. So far, these systems have really helped simplify the ongoing capturing of memories. I also store my camera in this desk (usually in that bottom section of the desk drawer shown above or on top of the desk) so taking photos is also simple. That part wasn’t really a challenge for me…even last year. I had originally intended to write just two posts on Project Life organization…but it seems I have a lot to say. (And I have some other biz projects vying for my attention right now.) So I’m going to wrap this post up here, and do one more post on this topic. In that post I’ll share how I organize and store the products I use for Project Life, as well as my process — so far — for putting pages together. Look for that post this weekend or early next week. Does anyone else get hung up at the photo editing stage of the process? How about in keeping the other bits organized and accessible? Thanks for joining the conversation! P.S. Just a quick public service announcement. We’re gearing up for the next session of my Organize Your Creative Space online workshop. If you’re ready to fall in love with your creative space, class starts February 14 and I’d love to see you there. Let me know if you have any questions about the class and if it’s a good fit for your creative organizing needs. Thanks! UPDATE: The expert-guided session has come and gone, but you can still purchase this class as a self-paced instant download. Here’s the link: Organize Your Creative Space Self Paced Class. This was a great post! I am desperately trying to do PL this year for the first time but it’s Feb and all I have done is the first page! HA! I’m already behind enough I feel defeated! But this answered some major questions for me about how to organize and capture the tiny details I forget. I love the notebook-in-purse idea and different storage techniques! SO glad I saw this pop up on Pinterest! Thanks Jodie! Don’t give up…there’s no rule that says you have to start Project Life in January. I really wish I had kept going last year even if I hadn’t done it perfectly. In fact, I’m thinking about going back and putting together whatever I can with the photos and documentation I do have from last year. I want the finished product that much. 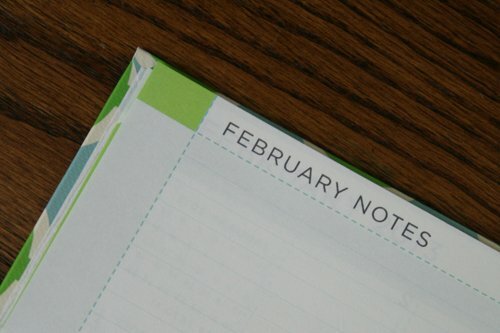 I have seen many Project Lifers on the web share that they too use a planner to write down what to remember for journaling about their week. I think it’s a great idea. I really find the photo editing part the most boring… Maybe I should consider taking the digital route for PL… I think I love paper and stamps too much though! Can’t wait for post #3! Thanks for sharing your ideas and the reasons behind them. It’s been really enlightening. Thanks so much Stephanie. I’m with you that the photo editing is boring. Great way to put it. I’m with you on loving paper. I love it too much to go fully digital. That’s the part I love most…holding the paper and photos in my hand, writing, tucking stuff into those little pockets. I’d miss that so much! I can get stopped up in the photo editing. I have found it’s REALLY important to have easy to use software. My other bit of advice, when it comes to a daily photo, I don’t worry so much about the edit. I print as is, it’s real life. 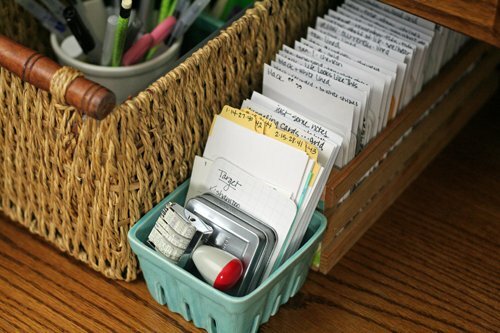 Organized and accessible is key, that’s part of why I choose to do project life differently, I didn’t like all those little cards. Thanks Kelli! I like your thoughts about unedited photos = real life. That makes so much sense. Thanks Aby for these posts on your PL system; full of good ideas and processes. I continue to refine my in-progress-process and will probably borrow a couple of your ideas to weave in, also. I find that note-keeping and photo-processing are critical. I have developed a workable system for me and I am in the process of drafting a blog post about it; I’ll share it as soon as it’s finished/published…hopefully by end of next week. Like Kelli, I don’t worry about a ‘daily’ photo and I print my photos at home, for the most part. I’m working on streamlining and simplifying my process, too. I’ll also share any conclusions I come to. I look fwd to your next installment. Thanks, Honore. It’s nice to see you here. Let us know when that post is up. I’d love to read your thoughts. My roadblock is getting the photos off the camera. Similar problem – computer not located where the family is, and I’m not always motivated after the kids go to sleep at night. Photo editing was always a big thing for me. I didn’t commit to doing it weekly and then I got backed up and then it was a LOT of work and then it didn’t get done…. If you can keep up with it weekly it is so much easier! I used a journal, the same one I used for work, appointments, my calendar – so nice to refer back to even now that I am finishing 2012! Thanks for your comments Laura and Suize! I use an app on my iPhone called momento to journal my days. I write and add pictures every day since October. I love to record my moments this way because it is convenient . However printing for my project life story is really hard for me. Thanks for these articles they have given me goods ideas. Are you always printing 4×6 photos? That’s the one thing that’s holding me back the most is I want to print different sizes for different protectors. I have the templates but they are for 12×12 and my printer prints 8.5 x11. Any suggestions on how to print for various protectors? I just print 4 x 6 and also 2 x 3. For the 2 x 3’s I use photo shop elements to put to 2 x 3’s on one 4 x 6 image. Works well for me! You ROCK! you are my hero! i have been struggling with the organization for PL…I love the system of notebook to carry and record, then the little dated file for small memorabilia and basket for the rest – it was how to do that part of it that had me so frustrated…obviously just putting it in a box isn’t going to work lol…my husband calls this my “life project”…and at the rate i’m going it will be…thank you for giving me hope !! Thanks for your comment Susan! Good luck! !